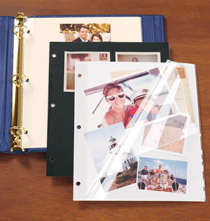 Exposures archival double weight 3.5 x 5 photo pocket pages are made of photo safe material which makes them the safest photo pocket pages available to protect your most precious photos. 9 5/8" x 11 3/8"
Pleasure to do business with This vendor. used to update photo album and i may be purchasing more very soon,,,good quality product,,can not find this product in the store,,,thanks for the service you provide! I like these in general (I've bought packages of a few different sizes) because they're sturdy and very clear. Photos show nicely in them One thing I especially like about this size in particular is that the horizontal pockets open on the side, not the top. This helps keep pix securely in place. A good idea. 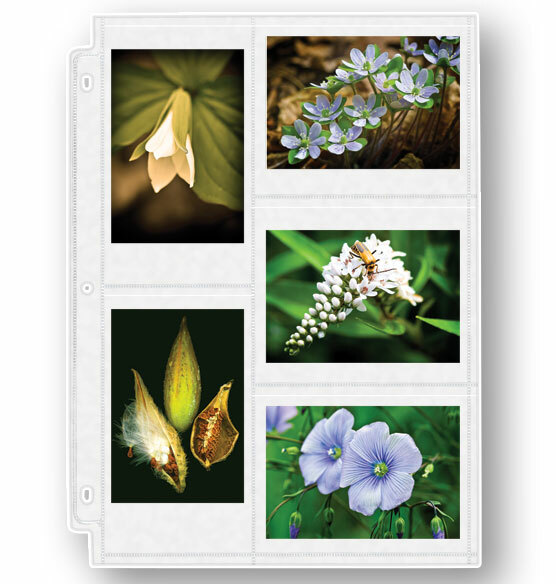 I'm using these and several other sizes for the mix of photo sizes I have from many old photos I'm creating. I'm doing albums for each of my three kids. I have photos from 1980 forward. The earlier ones are 3.5 by 5. I wanted pages that were all horizontal and some that were all vertical to mix in with these. Have both portrait and landscape 3.5 x 5 photos to file. Because I have old photos that are smaller than 4 x 6 so these pages should be good. Needed additional pages, like the layout. You had my product and I could not see anyone else that did. Nice arrangement - more horizontal than vertical. This is best way to save and protect photos. I have used these pages many many times. They are perfect! "Good quality. I'm doing a second album for my daughter and used this same product." I have hundreds of old photos of this size to transfer to archival storage. Because my previous purchase of 4x6 archival pages have worked out beautifully. I have a couple thousand more family photos to put into albums. I have been using these pages within my photo albums for years and they have held up well. i use 3 1/2 X 5 inch photos and thus far u r the only game in town that still provides these sleeves. 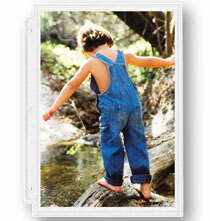 i hav used ur company for years and keep returning as the quality of the product is good. and I need more pages for my pictures. Do not use this size anymore. best. album pages. ever. been using for years! I love the horizontal/vertical photo option. These will be perfect for my daughters senior photo proofs! I wanted the old 3.5x3.5 size but it is no longer available. 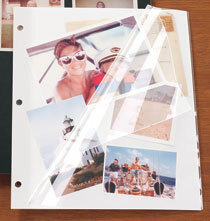 You can five photos on a page that fits into a standard three ring binder, vs. two 4.6 photos. Needed the two different directions on the same page. Just fill any unused with a 3.5 by 5 paper to journal on. To fit standard 3-ring binders, hope it works. I'm hoping these pages are thick and durable and clear. Because I prefer this size of photo and these pages are becoming increasingly difficult to find. Thank you for having them! WHAT SIZE ALBUM DOES THIS FIT? BEST ANSWER: Thank you for your question. All of our albums except 12 x 12. We hope this information will be of help to you. 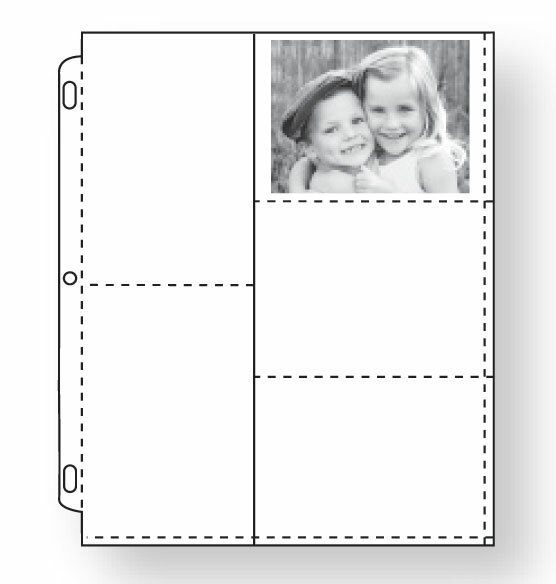 Are there pockets for paper tabs to identify the photos? I can't tell by the picture of the product. BEST ANSWER: Thank you for your question. There is no pockets for labels/id for the photos. We hope this information will be of help to you. Thank you so much! I really appreciate your taking the time to respond to my question. This helps me a lot. what is the overall size of the sheet? I'm having trouble fitting sheets into my album. BEST ANSWER: Thank you for your question. 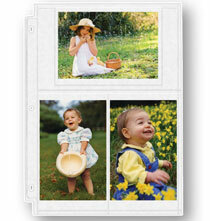 The 3.5 x 5 photo pages measure 9 5/8" x 11 3/8". We hope this information will be of help to you.